If you really have not a lot of time to spend on the landing sectors or just want to see the famous battlefields within a day or a part day tour. These one day tours can be made from Paris coming by train. I would then meet you in Caen or Bayeux train station or in the lobby of your hotel in Caen or Bayeux area. - or Pegasus bridge, a commonwealth cemetery and Sword Beach. The fee of a 5 hour tour is 400 Euros, it includes everything but lunch/coffee and museum entrance fees (up to 6 passengers in the car). It is not the price per person. .A 7 hour tour allows to cover the same sites more deeply (with time for a museum if you want to see artifacts) or to add one stop on the tour. The fee of a 7 hour tour is 490 Euros, it includes everything but lunch/coffee and museum entrance fees (up to 6 passengers in the car). It is not the price per person. 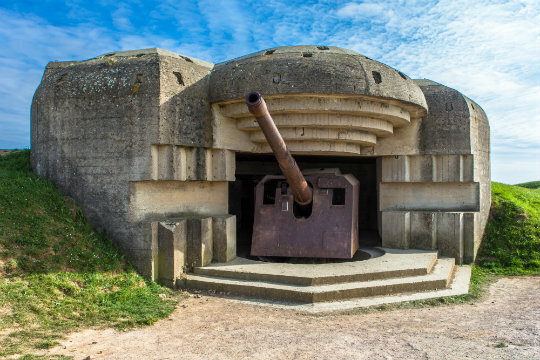 .A 8 hour tour permits to cover Pointe du Hoc, Omaha Beach and the Normandy American Cemetery and Mulberry port B. Or the tour would cover 2 of the British sectors (Pegasus bridge, Sword Beach, a Commonwealth Cemetery, Juno Beach, Gold Beach, Longues sur mer gun battery and Mulberry port B in Arromanches). The fee of a 8 hour tour is 550 Euros, it includes everything but lunch/coffee and museum entrance fees (up to 6 passengers in the car). It is not the price per person. The fee of a 9+ hour tour is 600 Euros, it includes everything but lunch/coffee and museum entrance fees (up to 6 passengers in the car). It is not the price per person.